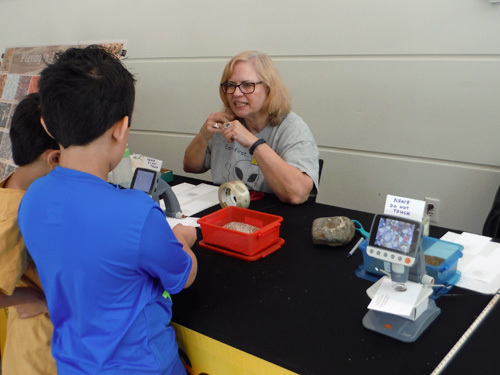 GMS was invited to share geology with visitors at Fernbank Natural History Museum at a special event called “Stones and Bones Day”. Jay Gorday brought a display of faceted stones and explained the process to visitors. Everyone was “wowed” by his beautiful gemstones. Jay also helped kids choose a sticker and gave away lots of show flyers. Shelley Stubbs helped me with sand cards. Kids were eager to make sand cards and view them with a digital microscope. We had a great time showing them a different way to approach geology. 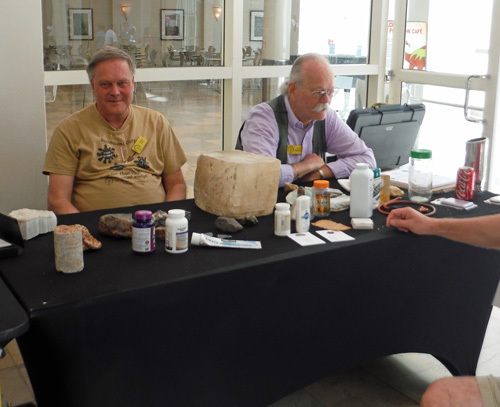 Bill Waggenerhad a table covered with rocks and minerals plus common household items that contain rocks and minerals. Visitors were surprised by all of the items and Bill did a wonderful job explaining how all of those things had rocks and minerals in them. And Charles Carter helped everyone when we needed help. 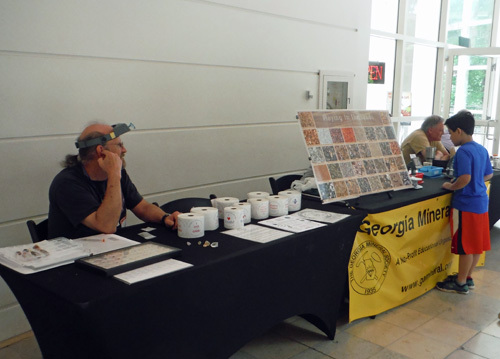 It was an action packed day and we all had a lot of fun meeting people and showing them why geology is so fun! Shelley explained biogenic sand and I helped kids with eroded sand. Both sands are a great way to see geology from a different perspective.